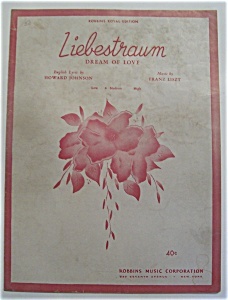 This copyrighted 1932 Vintage Sheet Music entitled "Liebestraum Dream Of Love (Robbins Royal Edition)" is in good condition but appears to be complete. This sheet music measures approx. 9" x 12" and is suitable for framing. The English lyrics are by Howard Johnson & the music is by Franz Liszt.